I’ll eat just about anything you can put on a plate, but I won’t admire just any plate you can put on a wall. Those plates must be historic. And Southern. And tell a story. When my wife of 15 years and I were concocting our wedding registry, (OK, let me restate that more accurately: when my wife of 15 years was concocting her wedding registry) there was one item that popped up on the “must have” list I had never heard of. Louise Irwin, creator of the Georgia Plates, would be so proud of our living room wall. As it turns out these Georgia plates are so famous that practically everyone who ever attended a Transylvania Club of Sandersville meeting knows all about them. What? You say you don’t know the story of Louise Irwin and the Transylvania Club of Sandersville? OK, well, maybe I don’t feel so bad. 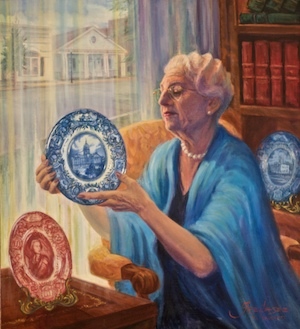 You see, back in 1932, Mrs. Irwin latched onto the idea of creating a series of Wedgwood plates depicting scenes from Georgia’s history to sell as a fundraiser for the club. Clearly Mrs. Irwin envisioned that 80 years later suburban housewives would be assembling and reassembling them into artistic formations on their living room walls. These plates are actually pretty cool. My favorite is the one depicting Nancy Hart holding a bunch of Tories, whoever they are, at gunpoint. Nothing says “Georgia pride” like gun violence against men in wigs in pink Wedgwood. I think we’ve eaten on these plates exactly one time. It was a special occasion, like Christmas or Easter, when it seemed appropriate to stare at James Edward Oglethorpe under a pile of mashed red potatoes infused with gorgonzola. There is so much I don’t understand about home decorating, and I’m sure this essay only confirms my lack of sophistication and taste. I don’t know when it became a “thing” to put plates on walls, but ever since our wedding guests happily complied with my wife’s dreams of owning the entire collection, we’ve had Georgia plates on our walls. 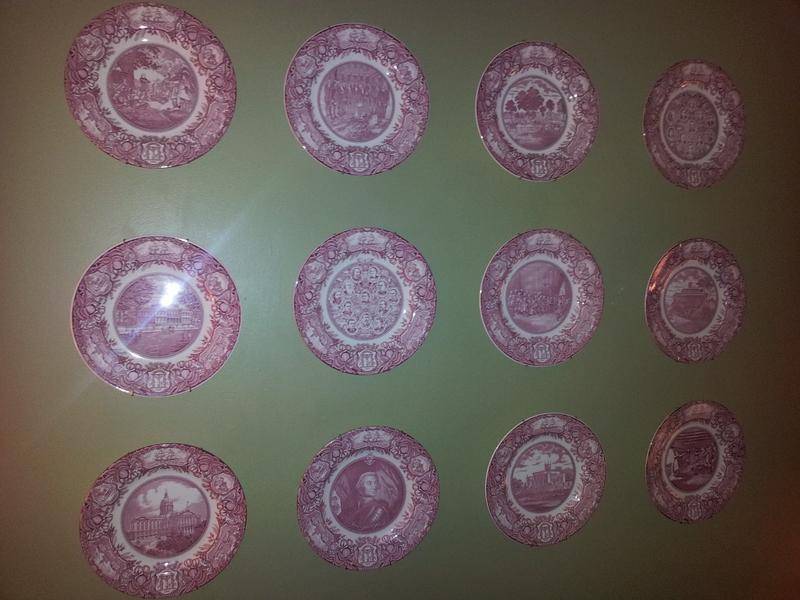 A very symmetrical and orderly display of Georgia’s history in Wedgwood plate form on my living room wall. Ain’t I sophisticated? Hmmm … maybe I’m beginning to understand why we don’t have many dinner party guests. What I do think these plates say about the New South is that there is still an appreciation of history. In the Old South, there was a devotion to tradition. In the New South, we like old stuff to remind us we have roots, a foundation upon which we can innovate, but we aren’t held captive to it. Touches of the old accentuate the new in our lives reminding us that as much as society changes, we still have a narrative that unites us as Georgians and Southerners. So, go ahead and put those Georgia plates on the walls. The Sandersville public library will benefit from the proceeds, and before you know it, there will be another day on the calendar appropriate for using them to eat, like Leap Day or Guy Fawkes Day. What place do plates have in your decorating? Do you use dinnerware in your décor? Share your thoughts by leaving a comment below, and happy eating/decorating! This entry was posted in Uncategorized and tagged contemporary South, family, Georgia, Georgia history, Georgia Plates, georgia pride, gifts, home decor, Home decorating, James Edward Oglethorpe, Lance Elliott Wallace, Lance Wallace, living room, Louise Irwin, Nancy Hart, New South, New South Essays, NewSouth, plates, relationships, room walls, Sandersville, South, Southern, Southern Culture, Southern Living, Southern style, Southerners, suburban housewives, the South, tories, Transylvania Club, wedding registry, Wedgwood. Bookmark the permalink. 9 Responses to Can I have a second helping of home décor? “Nothing says “Georgia pride” like gun violence against men in wigs in pink Wedgewood” Love it, Lance! And notice how my blog’s banner photo has a portion of a Georgia plate. I really do like them. Fun and well done blog. I’ve always wondered about plates on the wall!! Thanks for the education about GA Plates 🙂 Can’t wait to read about the scores of magnetic state sugar spoons attached on the fridge and pegged walls dedicated to souvenir coffee cups from waffle and huddle houses and coffee shops near and far!! Southern confession time: I have never heard of Georgia plates before. How sad! I may need to take a class from you guys! 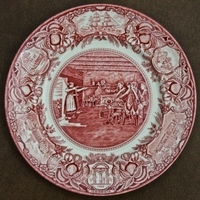 Just follow the link and you will learn the “official story” about the plates. They also conveniently have a list of Georgia retailers. There are a number in the area. I’ve never heard of the Georgia plates either…I’m a little too far north…still Southern, mind you! We do, however, have our Historic Oakwood, Inside the Beltline, and Old Raleigh traditions here in Raleigh, NC. Hmmm, great idea! Wonder if there are any Mississippi plates…. This made me laugh out loud. . . Good writing, friend. A few years on Missouri and my decorative plates came down. Truly Southern goodness, a plate on the wall!